Polly Myers is a lecturer in the University of Washington Department of History and the Integrated Social Sciences. 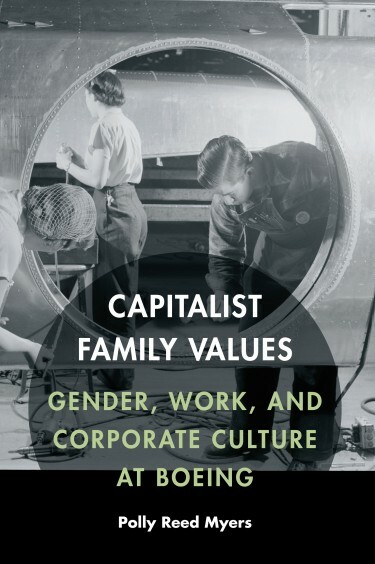 She is author of the book “Capitalist Family Values: Gender, Work, and Corporate Culture at Boeing,” published by University of Nebraska Press. She answered a few questions about the book for UW Today. Would you describe the concept behind this study of gender and corporate culture at Boeing? P.M.: This book looks at how ideas of work at Boeing shifted over the course of the 20th century as the company grew from a small, local company to a massive global corporation. I place women’s stories at the center of the book and focus on how working conditions, expectations and relationships changed as the company became more diverse and faced challenges such as World War II, the “boom and bust” cycles of the aerospace industry, and the geographic spread of the company. How did you come to research and write this book? P.M.: After earning my undergraduate degree in history, I did an internship at the Boeing historical archives and was amazed at how much I loved sifting through the archival boxes and looking at historical records. The internship provided the inspiration for me to pursue a Master of Arts in history and to write my thesis on Boeing during World War II. After a brief stint as a receptionist, I earned a doctorate in history and wrote my dissertation on Boeing during and after World War II, and that became the basis of this book. Having grown up in the Pacific Northwest, I also wanted to know more about the history of this region, and Boeing is an integral part of understanding that. “Familialism” — or the idea of a workplace family — is at the heart of this book. You write, “Familialism stabilized the workers in ways the product line could not.” Would you explain? P.M.: I define familialism as a sense of belonging and well-being that workers had in the workplace. Not all workers identified with it or experienced it in the same way, but it defined workplace culture at Boeing for most of the postwar period. It encompassed “little” things, such as celebrating work anniversaries in the company newspaper, but also bigger things such as building connections with local institutions such as the University of Washington and having workers rise through the ranks of the company. Boeing, and the aerospace industry as whole, has a volatile boom/bust cycle of layoffs that can be quite devastating to workers, and so providing workers with a sense of stability and belonging was a key way that the company weathered the ups and downs of the aerospace industry in the postwar period. Your research, you write, included study of “everyday encounters among company leaders, managers and workers.” What kind of access were you given to the Boeing world? P.M.: I was lucky in several ways. The internship gave me time to immerse myself in Boeing’s rich history. I was fortunate that someone who had worked there in the past had assembled a box of materials on women and gender at Boeing, and that box provided the inspiration for the book. By virtue of size, the Boeing world extends far beyond the company itself, and so I was able to use research from a variety of other places, including the Library of Congress and the UW Libraries’ Special Collections. I was also a huge beneficiary of the tremendous growth in digital history, especially in labor history, and the fact that organizations such as the UW Labor Archives and Boeing’s Machinist Union, Local 751, put historical records online. You write, “The story of Boeing’s workplace dynamics reveals the processes of capitalist empowerment of corporations in the 21st century at the expense of all workers and to the particular detriment of women.” Are things at Boeing as they always were, or did your study show improvement over the years? P.M.: Certainly at Boeing, and other corporations, workforces have gotten more diverse and women have made gains in traditionally male occupations, such as engineering, though the rates of improvement for women at all corporations are still pretty sluggish in terms of union membership, executive positions, and in wage equality. The Boeing “family” metaphor seems to have died. What hastened its demise? And what has taken its place? P.M.: Corporations have grown larger over the course of the post-World War II period, and workers no longer identify with their employers and fellow workers in the same way, partly because of the sheer growth but also because workforces are increasingly diverse and dispersed. As Boeing and other corporations have become more global, with workforces spread all over the world and increasingly large corporate bureaucracies, a new metaphor of “global teamwork” has taken its place. What has shifting to the metaphor of “global teamwork” meant for workers, particularly women? P.M.: For women workers, this has meant that men and women workers now have more in common with one another as employment for all workers has become more vulnerable and short-term, with layoffs and outsourcing now common practice. It has also meant increasing attention to diversified workforces and greater attention to equal employment opportunities, even if some aspects of equality, such as the wage gap, remain elusive. What would you like readers to take away from this study of Boeing’s corporate culture? P.M.: I hope that readers gain a sense of how powerful cultural norms are in the workplace. We often think of equality as something that needs to be regulated through laws and policies, and certainly those are important and necessary. But just as powerful are all of the unspoken assumptions that order the workplace — assumptions about who the ideal worker is and what the work environment should look like. Those assumptions have the power to define work in unequal ways. On the other hand, once those assumptions are recognized, we also have the power to work to organize workplaces in ways that empower workers and equal employment opportunities. For more information on “Capitalist Family Values,” contact Myers at 206-685-3211 or prmyers@uw.edu.